This entry was posted on Wednesday, January 30th, 2013 at 12:37 am	and is filed under Updates. You can follow any responses to this entry through the RSS 2.0 feed. You can leave a response, or trackback from your own site. Just tried our first bit of BLW tonight at dinner – avocado and banana. Nothing really got in the mouth, but she had a great time mashing stuff up! So glad you all enjoyed it. Some people put breadcrumbs on bananas and avocado, to make it possible to grip them. Mine weren’t at all good at holding slippy food, it was like that scene in Pretty Woman when the lobster flies up to the ceiling… so well done her for even getting to mash them. You know what convinced me? Someone gave me a baby purée recipe book. And it sounded like a lot of faffing around! Plus, it didn’t make sense to me that you’d purée a chicken stew. I may have mentioned this before once or thrice, but round about when dd1 was five months i was given for my birthday, FOR MY BIRTHDAY, a certain shoulder-padded puree lady’s cookbooks. I mean, really. Did i mention they were a present to me, for my BIRTHDAY? Well, my first child broke an heirloom highchair I’d carried from Africa to America trying to avoid a spoon and BLW was a sanity-preserver, knowing my job was merely to offer food he could safely ear and let him decide when he was ready. (Around 13 more, by the way.) The second child is much more agreeable, so his first food (which went nowhere near his lips but nevertheless amused him for 20 odd minutes) was rice noodles because I wanted to eat my Pad Thai. People recoil in horror, but seriously, please explain the mechanics of how rice noodles can block an airway. What’s that? Oh right, too soft, wrong shape, easy to pull back out with their long string. Gotcha. Oh yes, BLW is all about experimentation. And really, compared to the diaper scrutiny, it certainly wasn’t the weirdest thing going on. I’ve ben blw for a while now and what I really want out of it is for my son to grow up with a healthy attitude to food: to know when he’s full and stop eating; to see good as an enjoyable physical experience, not an emotional crutch or control issue; to trust his own judgement. Oid course now he’s 12 months he’s given up feeding himself and sits there with his mouth open waiting to have it placed in his mouth, but hey, at least that’s his decision! And I found slices of mango with skin still on were excellent starter foods. And roasted sweet potato wedges. Although this will forever be preaching to the choir somewhat, I think those are pretty good arguments! Did you see that recent study saying that although 30% of BLW mothers (low n) experienced at least one episode of choking, they weren’t worried about it. So I’m starting to think weaning choice is somewhat personality determined -low neuroticism ==> BLW. Coincidentally, the majority of choking incidences reported by those mothers involved apple.. So perhaps take note of Disney’s Snow White and hold off on le pommes! By the way, our daughter is now almost two, and a very varied eater still. My parents constantly praise her for being “good” at the table (that is, sitting still while entertaining them by smearing food all over her face). Thank you, BLW forum! i’m not sure i did see that study, my mum’s not been well so i’ve been thoroughly not paying attention to matters BLW. Do you have a link? Cameron, Sonya Lynne, Anne-Louise Mary Heath, and Rachael Waring Taylor. “Healthcare professionals’ and mothers’ knowledge of, attitudes to and experiences with, Baby-Led Weaning: a content analysis study.” BMJ open 2.6 (2012). ” Although choking can be very serious, all mothers who reported choking (n=6/20) reported that the infant independently dealt with the choking by expelling the food from their mouth through coughing and mothers did not have to intervene with first aid.” Therefore none of them actually choked in they way it is normally referred to on this site. Coughing on food is not uncommon in people of all ages and is just a baby learning to deal with food. It also states that 15/20 parents spoon fed their children sometimes – “Mothers reported doing this to avoid mess, to increase iron intake by spoon-feeding iron-fortified infant cereal, or to increase energy intake” I am not judging people who do this but I am surprised that 75% of their study, claiming to BLW, spoon fed for these reasons. Apparently the writers also doubted whether the parents were BLW or doing puree with finger foods. Obviously this has been debated at length on the forum and know that many parents use the approaches side by side. It says that spoon feeding was done rarely and usually in response to illness, so I’m not sure you can conclude that it was puree with finger foods, really. I’d not seen that report before – I find the patronising attitude of the health professionals in that report genuinely shocking. And these are opinions offered on the basis that half of them hadn’t even heard of BLW, never mind seen it in action. Really, HPs must think that we are all competitive idiots. Also, this choking thing, at 30%. It says not one of the babies needed intervention, they all dealt with it themselves, so I guess that’s why no-one was worried about it, if they could see the babies were coughing it up by themselves. Bloody raw apple, though, it’s the food of the devil, i tell you. I only meant the 2 mothers at the bottom who were recommending a mix of both. I am not calling for a ban on spoons! I also found the health professionals shockingly judgmental and ill-informed – I don’t think they had much real experience of BLW babies. 30% seems quite a high number Scotrail – I haven’t seen that research either, would be interested. There will always be some parents with a no-way attitude to BLW, but I reckon for those who are interested but nervous, or where one partner is for and one is against, the BEST way to convince them to give it a go is to join your Forum and get bombarded with advice from those who know their onions. Or broccoli. Whatever. Keep up the good work! They’re such a good bunch (of onions) on the forum, aren’t they? The site is very lucky to have them (and you). 30% doesn’t seem like a terribly high number when you realise they are talking about gagging… In fact, 30% seems quite low! My children fell over occasionally while learning to walk and I see gagging as a similar thing. I guess the learning to walk equivalent to choking would be falling down the stairs – every time they went near the stairs, I was there to guide/catch and whenever they ate I was there too (often having bits of my own dinner swiped). My eldest had her worst gag on apple too – the only food that my mum was scared about me offering! These mothers… they know a thing or two. I was wondering if they were talking about gagging too, i definitely think that a choke requires some action on the part of the parent. I didn’t need convincing, but this would have been a fantastic idea to deal with my mother-in-law!! I started BLW because I couldn’t see why I would feed my baby something that I wouldn’t eat myself. I happily eat spaghetti bolognese for example, but let’s think about putting that into a blender… hmmm, suddenly not so appetising eh? Oh yes, and I’m a bit slack too, and one of my least favourite household jobs is cleaning the blender/food processor! On a serious note, concerned friends have said to me ‘but how do you know how much he’s eating?’ Fair point – he seems to end most meals wearing the food I gave him – but I now reply that I know EXACTLY how much he’s eaten: just the amount he wants and needs! I can’t bear this feeding on schedule – some days I eat constantly, and some days… er, OK, I usually eat constantly, but my point is that some days I want lunch at 12 and some days I don’t get round to it until 2:30. Some days I’ll just have a piece of toast, other days I’ll fill my face, it just depends how I feel, and why shouldn’t a baby be the same? I trust him to eat as much as he needs. Spending weekends pureeing food? No, thanks! Being able to go out and about without having to worry about what I’m going to feed the kid? Yes, please! I made one batch of purees once. I used about 6 pears and ended up with one ice-cube tray full of very watery-looking meh. It took me about half an hour and I grazed my knuckles on the scritchy thing I was mushing them on. Compare: take pear, chop, throw onto the highchair tray. For added fun, use the IKEA apple slicer/corer thing (though not like DH does, with the corer thing on the worktop, blades facing up, while he pushes the apple down through it – he likes to live dangerously). Baby picks up pear! Baby looks at pear! Baby delightfully nibbles on pear and makes funny faces! Baby chucks pear on floor! Cat sniffs at pear! (Have you ever seen a cat eating broccoli? It’s like crack to them). It’s loads of fun. And your knuckles remain intact. I decided to do BLW because a couple of friends before me had and it seemed to make sense. Crumpet’s now 20 months and doing brilliantly with her spoon and fork skills, although still regularly decides that yoghurt is better eaten by hand! We really don’t have much mess either. Only a couple of gagging episodes early on, one of which was on a gingerbread man that had an over 12 months recommendation when she was only 8 months – silly Mummy! 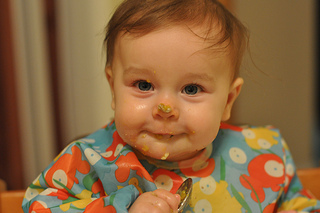 I would definitely do BLW again and recommend it as a means of weaning. So much more enjoyable than trying to get a baby to eat purée and less stressful when you give the baby control. They get the majority of their nutrition from milk anyway so no point stressing about food. Spoonfeeding seems like such a freaking hassle. A couple of weeks ago we had to spoonfeed said 10-month old (in a restaurant, no bib, noodle soup…). It was really annoying as he kept looking around to check out the place and so on. Don’t know how people keep it up for so long. We always knew really it was the right thing, but it was completely confirmed when hearing from a friend how she and her dh had been out for lunch with friends and they had to go out into the garden to distract their ds with a windchime so they could shovel the puree in! I just thought, how horrible. That does sound unusually bonkers, doesn’t it? I can’t believe I have only just found this website. I read the book whilst I was pregnant and loved how simple and fun it made weaning sound. My son is now 2 and we have a very food happy toddler. I get so annoyed when I listen to people struggling with weaning and complaining about how hard it is to make purees! Why are they even making purees? 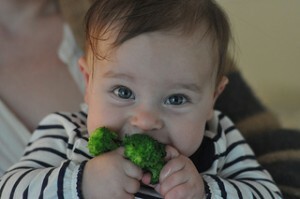 I just can’t understand why we aren’t all following Baby Lead Weaning. There was a couple of doubting moments along the way (due to other people’s opinions) but I am so pleased I stuck with it and it proved the right method for us. So delighted to hear it worked out for you! I did BLW purely by accident because it felt natural to me. I would get frustrated with my daughter taking the spoon away to do it herself, so I quit spoon-feeding her. I gave her a spoon and let her tackle oatmeal, yogurt and applesauce, and she was a pro by a year. My second baby never got to even try to take the spoon away. I didn’t have the time or energy to feed both of my girls and myself all the time. Plus, the time that the girls were feeding themselves was time that I could enjoy my coffee or clean the kitchen while they messed it up. Now I have three kids, all with excellent fine motor skills, and they are all good eaters. Brilliant news. It’s funny, isn’t it, the way that people assume that all children will want to do puree. In truth, it’s simply not the case, and BLW definitely offers mums who don’t like being spoon-fed an alternative. (and very often it’s an alternative that they’ve done before even knowing there is such a thing as BLW). I am doing BLW. Like so many others have already said, it makes sense! And saves time, and your baby is part of the meal, and it’s a learning experience! My one hang up does continue to be the choking. A few people have commented that if I’m so paranoid about choking, then why don’t I just puree? To me, the benefits far outweigh my fear. I’m learning to let my DS work it out for himself and learning to trust him in the process. I think the experience is adding to his sense of self-esteem, definitely his sense of independence. Motor skills, etc., are all bonus.